VERY IMPORTANT -- (The following is not legal or tax advice and cannot be relied on in any manner.) Richard Lehman, P.A., is suggesting that you ask the professional who is filing your tax return for 2008, whether prior to April 15 it would be prudent to file protective claims for federal and state income tax purposes for 2005 and any earlier years that remain open. 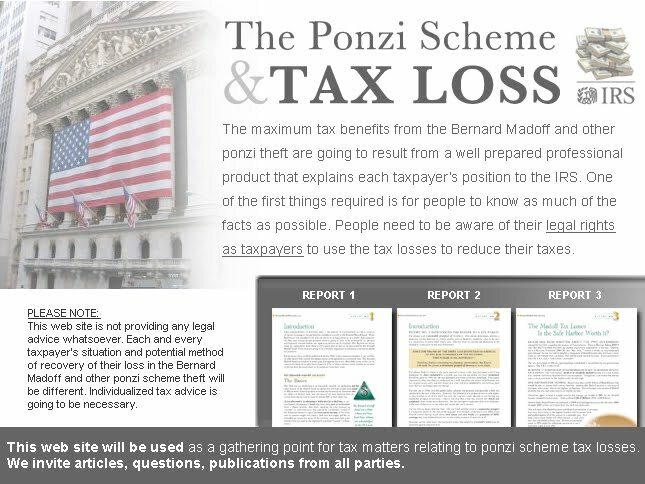 Protective claims are designed to hold the statute of limitation open until final decisions are made regarding the use of Madoff tax losses. Richard Lehman will also be posting Report No. 3 shortly. This Report No. 3 will consider the Internal Revenue Service guidelines and will focus on those persons who will not take advantage of the ”safe harbor” provided by Revenue Procedure 2009-20. There are going to be many factual situations in which Madoff victims will find there is significantly more value from a tax standpoint to choose to NOT take advantage of the “safe harbor” but instead will choose to follow the law as it now has been clearly defined in Revenue Ruling 2009-9. You will be notified by email when Report No 3 is posted. Make sure you are on our list - sign up here if you have not already.